This video lecture features Kent Hovind making his case on the stupidity of the evolution movement. FreeHovind.com is dedicated to Kent Hovind – A prominent Creation Science speaker, debater, and evangelist. Evolution is not part of science, its unproven, and something you have to believe in. On January 19, 2007, Hovind was sentenced to 10 years in federal prison for tax related charges. Hovind’s wife, Jo, was later sentenced to 2 years. Kent Hovind was once a science teacher and is is from a family of public school teachers. Based on his professional experience, he states there are lies in school textbooks. 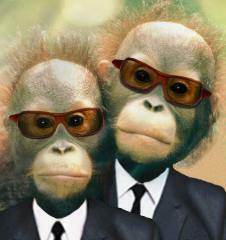 We want to evolve intelligence too, why were we left out! Believers in the evolution idea attack critics of the concept with immature schoolyard insults, because the science doesn’t add up. Chemical evolution has never been observed Nor has any other type of evolution, including organic. There is no evidence that life can come from non-living material. Evolutionists believe that dogs came from rocks. 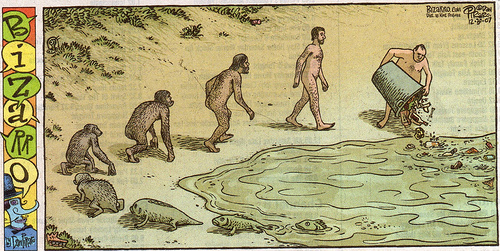 Macro-evolution: Changing from one kind of animal into another. Never observed. Micro-Evolution: Variations within species. Observed. Evolution is not part of science, its something you have to believe in. Evolution is theory created by racist eugenicist Charles Darwin. According to the same scientist who believe in evolution, the universe popped out of a space the size of half a proton. There is no proof of the Big Bang non-sense and there never will be. That’s why the big bang theory is just a theory. No Big Bang proponent can confidently explain where all the matter in the universe came from, where the energy came from, or where the laws of physics which the universe abide by, originated. Most dinosaurs may have died during the flood of Noah as described in the Holy Bible. We have no method to date bones back billions years. 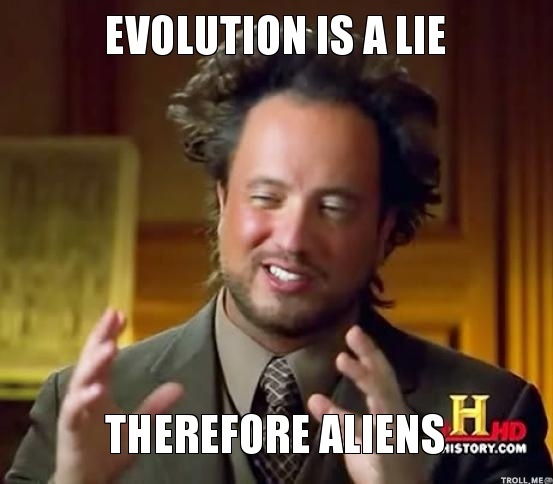 There are no intermediate fossils which prove the theory of evolution. One of the problems with the big bang theory is that some moons and galaxies spin backwards. this punches holes in the theory angular momentum being the sole cause of the planets and other celestial bodies, rotation. If the big bang theory were true, matter would be evenly distributed, but its not. Radio polonium halos kill the idea of the earth being born in lava and molten rock. The origin of life and the origins of animal groups remain unknown. There is no record of the event when life first appeared. Evolutionists believe life formed on its own, from non-living material, which is unproven, undocumented, and never duplicated. this isn’t science. Scientists have never produced life in a laboratory. A molecular cell is far more complex than a modern space shuttle. Laboratory experiments to produce artificial biological life end up producing results that are progressively worse off. Science can not explain how the male and female sexes evolved or why nature saw them as necessary. Evolutionist believe that rats and cherries are descendant of a single common ancestor. There are no fossils that prove evolution, fossils only prove something died. There is no evidence than any dead animal that became a fossil produced offspring. 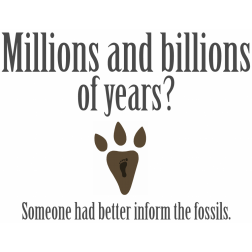 THERE IS NOT FOSSIL WHICH SERVES AS EVIDENCE FOR EVOLUTION. The ancient horse (hyracotherium), of gradual horse evolution theory, is still alive today. Similar engineering of biological mechanics between species is more indicative of a common designer than anything evolving. The geologic columns don’t exist. The geologic column idea was made up in the early 1800’s, before the technology existed to conduct aging experiments, the age of the geologic columns were created out of thin air with no evidence. Circular Reasoning: Strata are dated by the fossils, then fossils are dated by the strata. Petrified trees have been found standing up through multiple rock layers. Debunked: Millions of years to form the geological columns. It only takes a few years for trees to petrify. Petrification can be achieved in a laboratory in less than 24 hours. 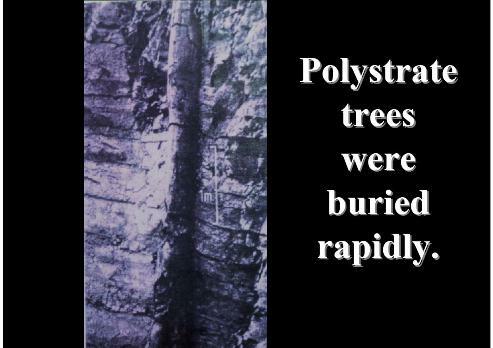 The flood of Noah is used as an explanation for the rapid burial of polystrate trees by multiple rock layers. Carbon dating is unreliable for more than a few years. Living matter has been carbon dated to be thousands of years old. The carbon date of your foot and your hand may be different. Lava from a volcano eruption in Hawaii in 1959 was carbon dated to be 8.5 million years old. In 1770 the earth was 70,000 years old. In 1905 the official age of the earth was 2 billion years old. In 1969 the official age of the earth and the moon was 3.5 billion years old. Today, the earth is 4.6 billion years old, officially. She ages fast, at the rate of 40 years per minute. 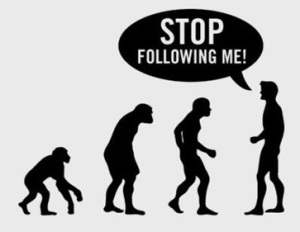 Charles Darwin’s evolution theory was based on racism. Charles Darwin’s family profited from slavery. Evolution was the farm that grew the white superiority idea which was the basis for Hitler’s justification for killing Jews. Dinosaurs aren’t birds and never have been. Dinosaurs have always been referred to as dragons, up until about 100 years ago.